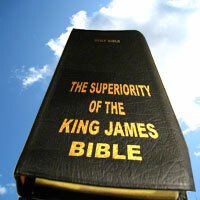 #025 The Superiority Of The King James Bible | That's In The Bible? « #024 Should Christians Keep The Sabbath? Can one Bible translation really be better than all others? Is the King James Bible really better than all of the “modern” translations? What about the originals? What about the Greek? Introduction: Many bible colleges today if not most teach that the King James Bible is only a translation, and as a result is not infallible. They teach that only the original autographs were ever inspired by God. Now since those originals have long since disintegrated and all we have is copies of the originals these professors believe that the King James Bible cannot be perfect. So tonight I want to give you a few out of the hundreds of reasons why the King James Bible is the infallible (never fails), inherent (absolutely no mistakes), pure words of the living God. God promised to preserve His words so that every since generation would have them. (Psalm 100:5) “…his truth endureth to all generations,” in (John 17:17) the bible gives us the definition of what “his truth” is; “…thy word is truth.” This Bible contains God’s truth that will endure to all generations. Now if there is not a Bible on this planet that is perfect and true then God lied! Some may argue and say; “But all translations of the Bible are God’s word, not just the King James Bible.” But that theory is impossible because all the new translations since the King James contain totally different readings which brings confusion and we know that God is not the author of confusion (2nd Corinthians 14:33). God has warned us not to tamper with His words (Revelation 22:18-19), His words were being tampered with from the start (2nd Corinthians 2:17), (Jeremiah 23:36). So if God promises us that He will preserve His words while others will tamper with them and corrupt them, then we have to find where God preserved His words. I have no doubt in my mind that the Authorized 1611 King James Bible is the 100% preserved words of God. The One True God has one true book. 2) A translation can be even better than the originals. Lets look and see what God thinks about translations rather than what fallible man thinks. Listed here are the only three passages in the Bible talking about translating. A) (2nd Samuel 3:9-10) Here God translates Saul’s Kingdom to David. If you do any Bible reading at all you know that Saul had many problems and was not God’s choice to be King. Although David had some problems of his own he was God’s choice to be king. Also the Lord Jesus Christ came from the lineage of David. So God does the translating here and its translated to something better. B) (Colossians 1:12-14) “Who hat delivered us from the power of darkness, and that translated us into the kingdom of his dear Son:” Again God is the one doing the translating and He translated to something much better. C) (Hebrews 11:5) “By faith Enoch was translated that he should not see death; and was not found, because God had translated him: for before his translation he had this testimony, that he pleased God.” Again God does the translating and the translation is always to something better. D) So God used men to translate into the King James Bible perfectly His words just as He had used man to write down His very words in the original autographs. It was ultimately God that wrote the Bible and its ultimately God that translated His words into the English in the KJV perfectly and without error. 1. The King James Bible has chapter and verse headings while the originals never did. We can very easily all turn to any of the passages God has laid on the preachers hearts, or even in our individual Bible studies, but if we had the originals it would be impossible to all turn to the same place. 2. The Manuscripts that have been found were either all in upper case or all in lower case letters. But the King James Bible has both upper and lower case letters. For example when we see Spirit we know that it is the Holy Spirit because the S is capitalized. Also Word we know is the Lord Jesus Christ because the W is capitalized. With the originals and the manuscripts this would be impossible. 3. Also most of us do not know Greek and Hebrew. The King James Bible is written in the common mans language in the English. The majority of the world today, whether you want to be a great business man or in the military you have to learn English as a second language. So God has used the English to get the Gospel across the world. 3) The King James Bible was translated under a king: (Ecclesiastes 8:4) says; “Where the word of a king is, there is power:” All the other modern versions were not translated under a king. The king’s name was “James” which is the English name for “Jacob”. Jacob is a Jewish name, and in the Bible Jacob was renamed “Israel” because he had power with God and with men (Genesis 32:28). So God not only translated His words through a king, but He also waited until a King with a Jewish name. We know that in (Romans 3:2) God says that the words of God (oracles) were committed unto the Jews. So in like manner the King James Bible is translated under a King with a Jewish name. God is always consistent in how he does things. 4) The King James Bible was translated from the majority text: The majority text means that of all the manuscripts they found, which equal over 5,000 all line up with the King James Bible. 95% of all manuscripts supports the King James Bible, while all the other modern versions are supported by only 5% of the manuscripts. These manuscripts that the other modern versions were translated from were corrupt. These manuscripts are call the “Vaticanus” and the “Siniaticus”, these manuscripts were filled with many roman catholic alterations to line up with what they believe. They also included the Apocrypha which the Lord Jesus Christ excluded from the old testament (Luke 24:44). 5) The King James Bible has no copyright: Every other Bible version on the market has a copyright on them. The KJV is the only one that can be copied and distributed without having to get anybodies permission or pay royalties. So churches are able to produce KJV Bibles and spread the Gospel around the world having only to pay for the materials to make them. This goes along with what God teaches us in His word (2nd Timothy 2:9) “Wherein I suffer trouble, as an evil doer, even unto bonds; but the word of God is not bound.” The KJB is not bound up in copyrights so that it can be distributed freely. (Proverbs 23:23) says; “Buy the truth, and sell it not…” All these new versions coming out almost yearly now is just to make money off of their copyrights. Those behind the new versions do not have a love for the word of God, but a love of money (1st Timothy 6:10). 6) An Obvious reason why the KJV is God’s perfect preserved words because it has not been proven wrong once in 400 years. No one has been able to disprove the fact that every word in the KJV are God’s pure inherent words. It is innocent until proven guilty. Scholars for 400 years have been trying to find errors and haven’t been able to find one single one! All the other versions have many mistakes while the King James Bible stands as the Authorized Version, the Bible that God Authorizes. – Bodily Resurrection: (Acts 1:3), (Luke 24), also the last 12 verses of Mark. 8 ) Absolute time comes from Greenwich England, absolute location (latitude and longitude) comes from Greenwich England, absolute measurement (the British thermal unit), so absolute truth has to come from England the King James Bible. 10) The KJV was translated for the purpose of bringing forth fruit. The biggest revivals took place during the Philadelphia church period when the KJV was available. In (Matthew 7:20) Jesus Christ says; “Wherefore by their fruits ye shall know them.” Charles Spurgeon, Dwight L. Moody, and Wesley were all KJV bible believers during the Philadelphia church period along with Billy Sunday who had led over one million people to the Lord Jesus Christ. -Now about this fruit: #9 is the number of the fruit of the spirit. A)(Genesis 9:1)”And God blessed Noah and his sons, and said unto them, Be fruitful, and multiply, and replenish the earth. B) The book of Galatians is the 9th book in the New Testament. -Galatians as a word has 9 letters in it. -When you turn to (Galatians 5:22) you have the 9 fruits of the Spirit. -When you add up 5+2+2=9. -Abraham was mentioned 9 times in the book of Galatians. -Abraham was 90 while Sarah was 99 when they were to have Isaac their son. C) Paul, the greatest Christian that ever lived who was the most fruitful Christian gets saved in Acts chapter 9. This entry was posted on November 25, 2009 at 5:42 am and is filed under That's In The Bible - Podcast. You can follow any responses to this entry through the RSS 2.0 feed. You can leave a response, or trackback from your own site. I have searched every bookstore here in Kotka, Finland to find a King James Bible, and I can not even find any bible in Finnish or English! Prayer is desperately needed. Arianna, thank you for writing in and leaving us comments. Its such a blessing to see that there are young people out there that are hungry for the word of God and search the scriptures! [Acts 17:11]. I will be praying for your area there that God would send some Bibles to Finland. Here in the United States it is getting harder and harder to find King James Bibles. When you go into any bookstore they only have maybe a handfull of KJV Bibles while they have hundreds of all the other per-versions. But I guess it all comes along with the great falling away that God told us would come about [2nd Thess. 2:3]. All we can do is pray and exalt the Lord Jesus Christ wherever and whenever possible! Thanks again Arianna, God bless and keep tuning in and leaving us comments! Thank you for your prayers!!! I just recieved four KJV Bibles in the mail that I had to ask Soumalainen Kirjakauppa (Finnish Bookstore) to order, and although they have horrible footnotes that attack the translation (such as scholars believe that the leviathan mentioned in Job is an elephant! ), it was such a blessing for me to recieve them because a fellow exchange student here from Italy who is an athiest has been extremely interested in hearing what the Bible has to say. It is really amazing because her father is an athiest, and she hasn’t heard very much at all about christianity at all except for her catholic friends who she describes as people who don’t even believe in what they “believe” and follow the pope no matter what. She is very good at languages, and the fact that the King James Bible is in Old English makes her want to read it even more!! She said that she loves the thous and thees in old english and the way that it is phrased–isn’t that amazing that most lost people in America see the old elements of the KJV as being a turn off to the word where here, God is actually using that as an attraction to his word!